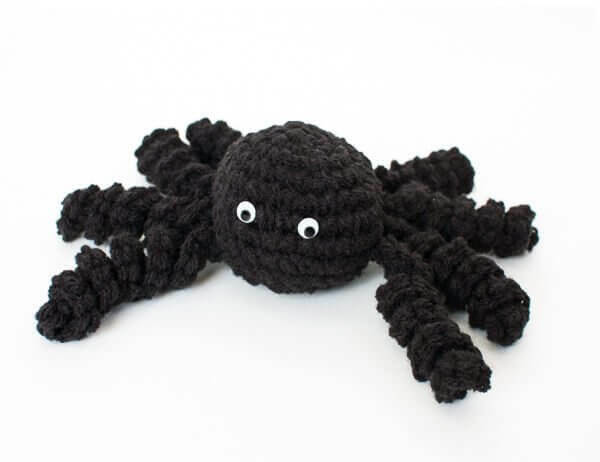 This crochet spider pattern works up in no time at all and adds such a cute touch to your Halloween decor! Prop them on a counter, place them around your table, or hang them in the doorway to delight your little ghouls and goblins! 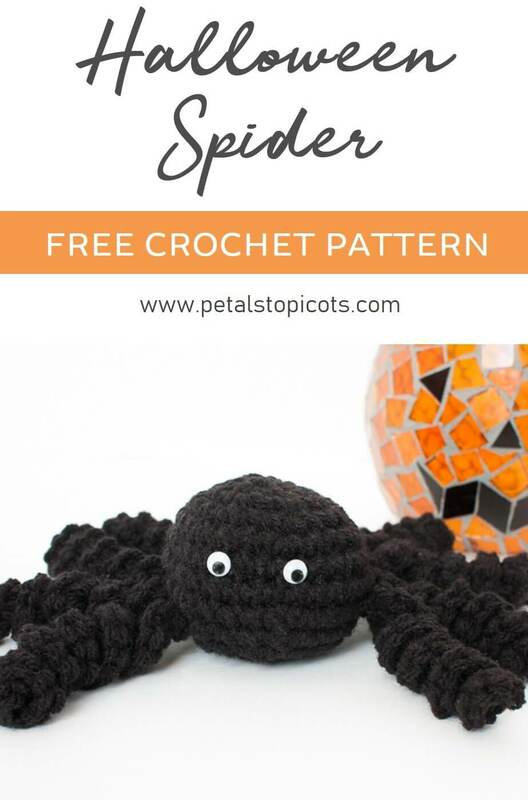 And be sure to check out my free spider web pattern here for a perfect prop for your little spider. Add the pattern to your Ravelry library here. Round 1: Ch 1 (does not count as st here and throughout), work 6 sc in ring, join — 6 sts. Round 2: Ch 1, work 2 sc in same st as join and in each st around, join — 12 sts. Round 3: Ch 1, work 2 sc in same st as join, 1 sc in next, *2 sc in next, 1 sc in next, rep from * around, join — 18 sts. Round 4: Ch 1, work 2 sc in same st as join, 1 sc in each of the next 2 sts, *2 sc in next st, 1 sc in each of the next 2 sts, rep from * around, join — 24 sts. Rounds 5 through 8: Ch 1, work 1 sc in same st as join and in each st around, join — 24 sts. Round 9: Ch 1, beginning in same st as join, *sc2tog, 1 sc in each of the next 2 sts, rep from * around, join — 18 sts. Round 10: Ch 1, beginning in same st as join, *sc2tog, 1 sc in the next st, rep from * around, join — 12 sts. Round 11: Ch 1, beginning in same st as join, *sc2tog around, join — 6 sts. Fasten off a long tail, and using a tapestry needle, weave yarn through remaining stitches and pull hole closed. Weave in end. Row 1: Work 3 sc in 2nd ch from hook and in each ch across — 48 sts. Fasten off leaving a long enough tail to fasten leg to body. Using a tapestry needle and the long tails, sew 4 legs to each side of the spider body at Round 9. Weave in ends. Using a little dab of fabric or craft glue, stick craft eyes at around Round 6. 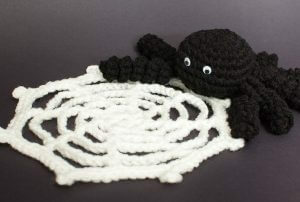 Want to make a cute spider web for your new friend? Click here for my free spider web crochet pattern. Hi Kara! 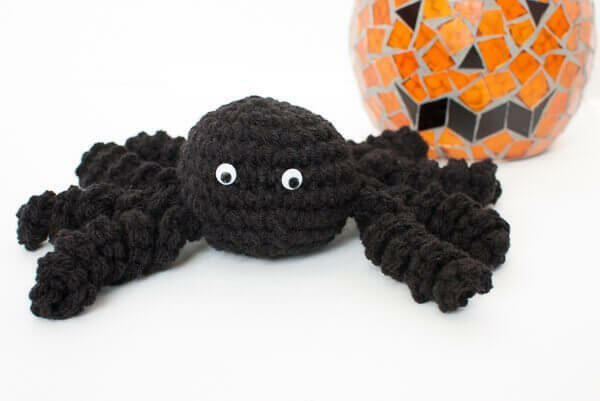 Every year at Halloween time I make this adorable spider for gifts. It is so cute and you give easy to understand directions! Thank you so much for a great pattern! I haven’t done any crocheting for quite awhile, but thought maybe I could handle this project to make for the grandkids. I don’t understand how the legs curl like in the pictures??? How do you do that? Hi Laura 🙂 The increases will make the leg start curling. That is one cute spider! Thanks for sharing the pattern.